It is New York Film Festival season, a favorite time of year to Milton and me. Although we have ordered tickets in advance to several screenings, when we learn that tickets are still available for certain films we had not planned to see, we occasionally pick up a pair at the box office. That was how we got tickets to a three o’clock screening of the Cannes Film Festival Palme d’Or winner, Uncle Boonmee Who Can Recall His Past Lives. As I am walking to Lincoln Center to meet Milton to attend this screening, my cell phone rings. The caller is Milton. Me: I’m almost there. I’m five minutes away. Milton (eerily calm; always a bad sign): I just looked at the festival’s calendar. The three o’clock screening is for Le Quattro Volte. 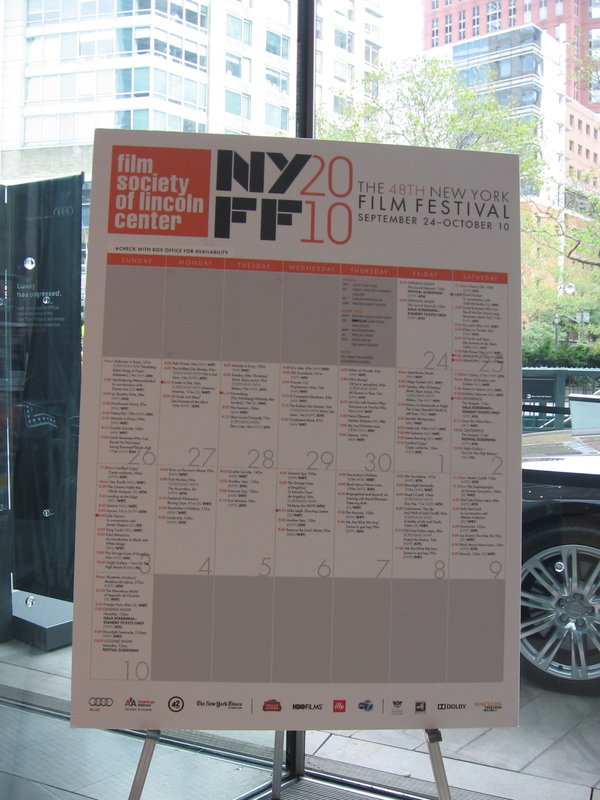 Required reading: New York Film Festival calendar. Milton: The calendar says that Uncle Boonmee screens at nine. Me (morphing into a parrot): “Nine”? Me: How is that possible? We’re seeing Angels in America at 7:30. The Signature Theatre Company has revived Angels in America. Milton and I purchased those tickets two months ago. We purchased our Uncle Boonmee tickets around eight o’clock the night before. We were surprised that there were any tickets left to such an acclaimed, albeit difficult film, written and directed by soon-not-to-be-a-household-name, Apichatpong Weerasethakul. Our friend, Judy, had warned us that it is best to be well rested and heavily caffeinated for this one. Milton: Look at our tickets. What time is the screening? I look at the tickets. The musical cue is the downbeat. My stomach acid soars like a rocket to Mars. Moments later when I see Milton smiling I open my mouth to greet him, but instead, I singe his face with flames. In response, he morphs into a Jewish mother and blames himself for this predicament recalling that he was one-and-a-half sheets to the wind when he noticed the sign that said tickets to this alleged three o’clock screening of Uncle Boonmee were still available the night before. I remind him that I was stone cold sober and standing next to him looking at that exact same sign. It did not occur to either of us that the announcement was for a three o’clock screening that had happened earlier that day, i.e. a past screening. I bounce up to the box office window like a featherweight boxer determined to make mincemeat out of my opponent, in this case a sleep-deprived woman somewhere in her forties. Feigning calm, I explain our situation to her. I play the humility card and admit that we were boneheads that did not look at the show time on our tickets while standing at the box office window. 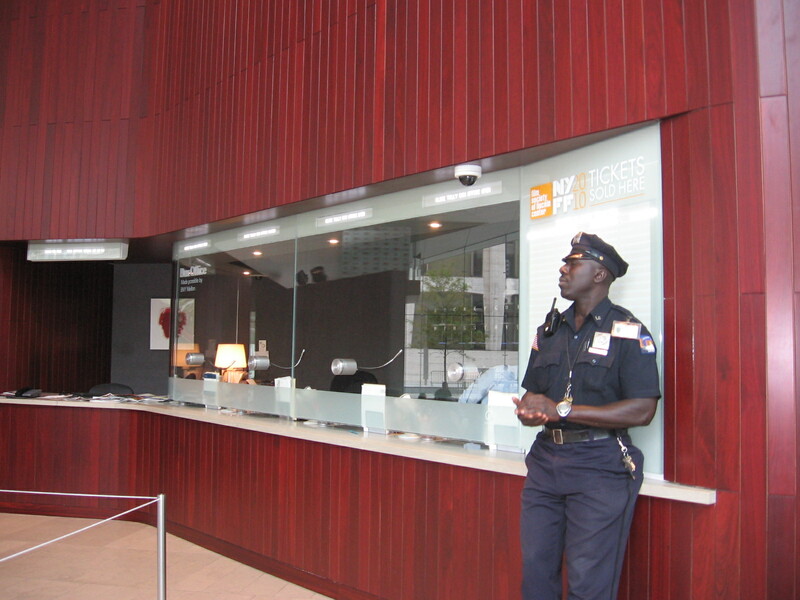 Alice Tully Hall box office window; a window we now know well. Ticket Seller: There are no refunds or exchanges for tickets purchased for same day screenings. Me: This was an honest mistake we made. Ticket Seller: Would you like to see what’s screening today at three o’clock? Me: No. It’s not Uncle Boonmee. Ticket Seller: Yes, Uncle Boonmee screens at nine. Me: We’re seeing Angels in America at nine. If we knew Uncle Boonmee was screening at the same time as Angels, we would not have bought these tickets. Ticket Seller: Would you like to see something else at another time? Milton (elated): We can make an exchange? Ticket Seller (completely worn down): Yes. Milton: I can live with that! We select The Strange Case of Angelica, a ghost story written and directed by 101-year-old Portuguese filmmaker Manoel de Oliveira. De Oliveira directed his first film in 1942, his second in 1963, his third in 1975, three more in the eighties, five in the nineties, and nine in the 2000s. If he lives another 101 years, at this rate, he’ll be cranking out features weekly. Before leaving the box office window we double-check the date and show times on our tickets forty-three times. This entry was posted in Humor and tagged movies, new york film festival, snafu. Bookmark the permalink. I’ve never been to New York City, so it’s fun to read about your everyday adventures! I like your writing, too. I like the way you write, great, wacky descriptions of people,etc. Yeah, I’m a country bumpkin, so city life sounds exciting. You made this lame adventure crackle, like the glaze on a glowing chunk of raku-fired clay upon it’s re-enty into the room temperature world. If you want to go thrift shopping or to the coast, stop by again soon. Glad you charmed her into an exchange.